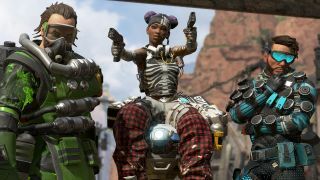 The Apex Legends battle pass lacks Fortnite-style challenges, but the Apex Legends 'Legend Bonus' still rewards changing up your playstyle. Never heard of it? Don't worry, the Legend Bonus is hidden well for how big of a boost it can give your battle pass progress. Let me spin my chair around and rap with you for a minute about weekly bonuses. The Apex Legends Legend Bonus gives you up to 25,000 extra battle pass points based on your in-match Survival Time every week, for each character. This means you'll probably hit the 25,000 limit with your main pretty darn quick. Then you might as well try out a new character to keep earning more bonus points. Think of it as a gentle push from Respawn Entertainment to broaden your Legend picking horizons - also to buy more characters, if you play enough to cap out the free ones. That should keep you trying different characters on a weekly basis. There's another little bonus which may get you swapping around on the daily: your First Kill of the Day with each character will give you another 500 battle pass points. It's easy to miss, but it'll show up along with the rest of your post-match stats. I tend to play Lifeline almost exclusively unless somebody else picks her first, but I cannot resist the siren song of bonus points… so, uh, sorry in advance to all the squads who have to suffer through me learning the other Legends. Make the most of those weekly and daily bonuses and you should have a much easier time leveling up your battle pass. Assuming you can actually manage to land a kill with poor Gibraltar. Not so excited about earning all the battle pass rewards? Respawn Entertainment says Apex Legends' seasons will keep evolving and this is just the start. Or just take a glass-half-full look at all of the stuff you can earn in this battle pass rewards video.